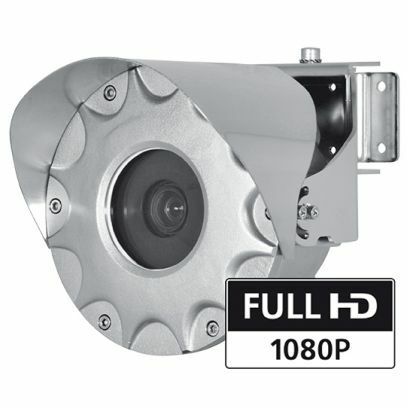 The explosion-proof Full HD camera MAXIMUS MMX is perfect for efficient video surveillance and control of processes in hazardous environments where the atmosphere is potentially explosive due to the presence of inflammable gases or dust, typical of the Oil&Gas, marine or industrial and foodstuff sectors. The Full HD, 1080p camera, with 3x or 10x motorised zoom lens, offers multiple video streams (H.264/AVC, MJPEG, JPEG, MPEG4) and provides exceptional image quality, picking out every detail in a scene, even in the harshest environmental conditions. An absolute advantage offered by this camera is its extremely easy and safe installation. The camera can be supplied with multi-polar cabling. The camera can also be powered in PoE+, thereby allowing further simplification of installation operations. The camera is supplied with supports for wall, ceiling and railing installation and with a sunshield. The housing is entirely manufactured in stainless steel AISI316L offering complete resistance to corrosion. Thanks to its compactness (only 116mm) and contained weight (only 6.5 kg (14.3lb)), it can be installed in narrow locations typical of industrial surroundings. The IP66/IP67/IP68/IP69 level guarantees complete protection against bad weather and water immersion. Another important feature of the camera is the extended certification temperature range of -40°C to 70°C. The MAXIMUS MMX range of cameras meets every installation need, providing maximum performance and excellent value for money. The MAXIMUS MMX product with 10x Full HD camera is Lloyd's Register Type Approval System Test Specification Number 1 certified and therefore can be used in Marine and Offshore applications for environmental categories ENV1, ENV2, ENV3 and ENV5 (eg. passenger ships, open-air decks, closed spaces and technical areas that may be subject to heat generated by other equipment, potentially explosive areas, docking procedures).